Attention friends of Caturday, your favorite day of the month is back. 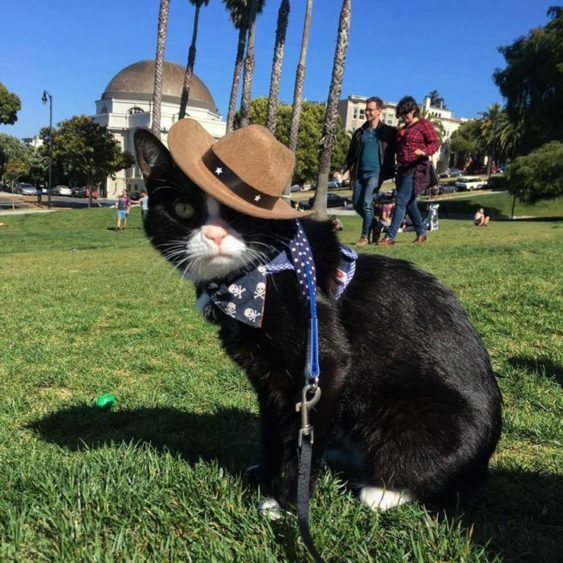 First Caturday is a day to reclaim the glory of the outdoors for your feline friends. It is a day for charming and delightful outdoor cat-napping and socializing. It is where you can freely exchange information, friendship, and joy to help make your cats happy and healthy. Some cats actually like leash walks, others stroller walks, and still others just to come to the park in their pet carriers to listen to the birds sing. It’s completely fine if a cat decides, nope, no park for me please. Totally fine if a cat doesn’t like First Caturday and wants to go straight home. Or it’s completely fine if a cat decides to stay inside the pet carrier and not come out on the leash. Or, if you’re without a cat and just want to come and scope out the chill kitties. But if you try bringing your cat in one of these safe and supervised ways, you may find that your cat likes fresh air and the change of scenery. This is one more option to enrich your cat’s life. If you have a shy kitty, you can skip the big group, and just try sitting in your backyard with your cat in the carrier. With or without a cat, you’re welcome at #firstcaturday.